Glazing: Crystal Clear Polycarbonate Panels - Clear as Glass and Strong as Steel! 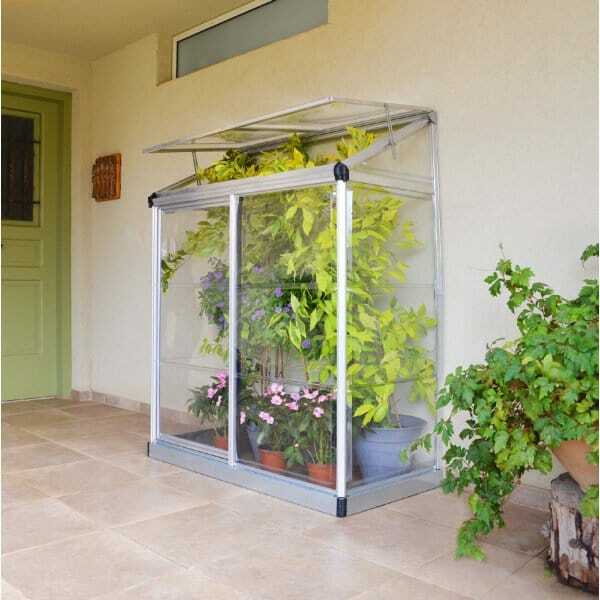 Palram Lean To Grow House 2ft x 4ft: Featuring an Aluminium frame, a galvansied steel base, adjustable roof ventilation and crystal clear polycarbonate panels which are virtually unbreakable. The really beneficial feature is that it blocks all the harmful UV rays while still allowing over 90% light transmission, thereby creating a consistently healthy environment for growing your plants. This coupled with a combination of a very straightforward lightweight sliding panel assembly system and the fact that it is delivered in easy to handle packaging, creates a simple and pleasurable experience to assemble. With many features usually associated with much more expensive greenhouses, the Palram Lean To Grow House is simply excellent value for money! Showing 2 of our total 3 reviews, with an average rating of 5 stars. Read all 3 reviews for Palram Lean To Grow House 2ft x 4ft. Good quality lean to, fairly easy to assemble with a few fiddly bits. Review - I was very pleased with the purchase. It has been great so far in the summer. I will see what happens in the winter regarding strength as it does rattle a bit in the wind. Just what I wanted though and so far not disappointed. I was very pleased with the purchase. It has been great so far in the summer. I will see what happens in the winter regarding strength as it does rattle a bit in the wind. Just what I wanted though and so far not disappointed.